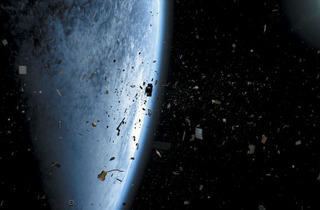 An avalanche of space explosions, in 3-D.
I’ve always wondered where satellites go to die. 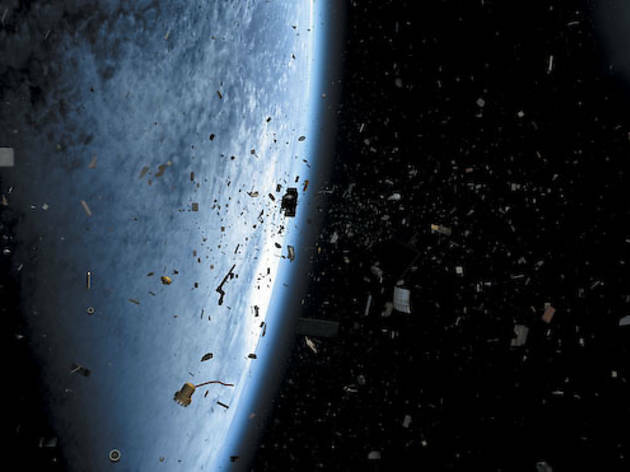 Thanks to the [node:33714 link=Adler Planetarium's;] new space movie, Space Junk, I now know thousands of defunct satellites stay in Earth’s orbit, traveling at perilous speeds. This half-hour 3-D film explores the titular phenomenon while following Donald Kessler as he expounds upon his “Kessler syndrome” theory—that orbiting objects will occasionally collide and, moving 17,000mph, set off an avalanche of explosions. If it sounds scary, it should: The film’s intention is to warn the public that space exploration might cease entirely due to vast fields of debris shooting through space like super-fast rifle bullets. As you can imagine, this makes for good entertainment: The flick’s illustrations of 3-D explosions compensate for a strange CSI-like scene of stiff actors playing workers from U.S. Space Surveillance Network, the organization that tracks space junk.